A few weeks ago I mentioned I taught a wonderful friend of mine to knit. Little did I know that she is a natural born knitter! Or a knitting whisperer as my husband calls her. She completed her ribbed scarf in one week. Wowzers! Now, it’s not like I wrote in my diary when I first attempted circular knitting as if it were a first kiss, however I’m pretty sure I’d been knitting for at least year before I tried it. She’s fast. Note the perfect nail as well. 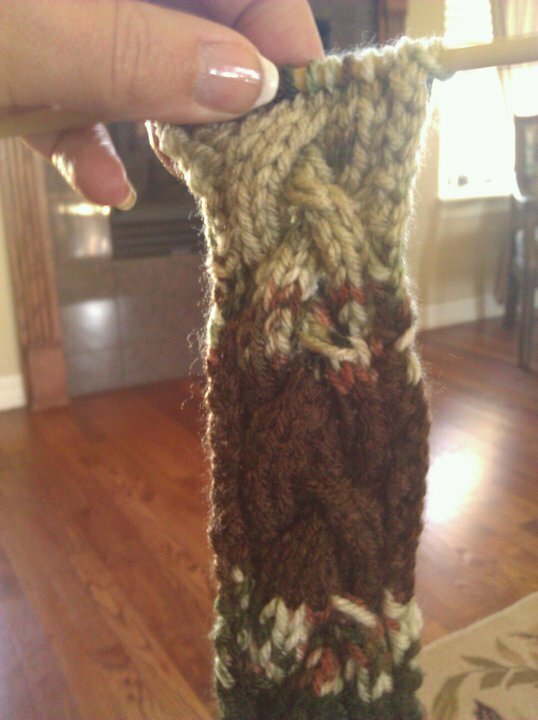 Great googly moogly – her third project and she’s cabling already! She is the reincarnated soul of Elizabeth Zimmerman. Soon we’ll have to look for her knitting books in stores. I say it’s awesome, just like she is. More of us should practice fearless knitting! I love this post. You had me laughing from the first 2 sentences. Oh to even have 1/4 of Elizabeth Zimmerman’s genes would be awesome! And it takes a great teacher to explain the basics so well that a talented person can take them and run from the very beginning – kudos to you for being that teacher! You’re very kind, and though I may have laid the foundation, it’s all her now. It’s all due to a fabulous teacher!